This is the compact edition of VideoShow video editor, reduced size and optimized for all devices. 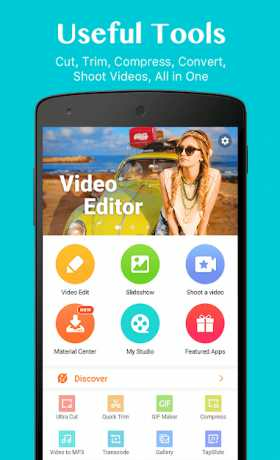 One of the best video editor & video maker apps in the world. The app is completely free. You can export videos, clips without duration limit, remove watermark or make your own mark. 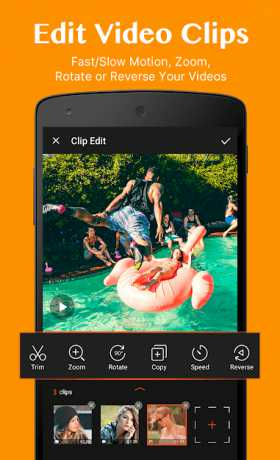 VideoShow is a powerful movie editor& slideshow maker apps in the whole world, and it’s frequently used to make videos, photos, images, slideshow among young people. VideoShowLite is a quick movie maker/filmmaker/video player/slideshow editor/screen recorder that lets users create stylish videos with ease. It’s popular among both professional photographers and non-professional beginners. We provide video live wallpapers, beauty camera, gif stickers, cute filters, magic effects, special doodle, gif memes, slideshow animation and crop video square free. – Beauty Camera:We provide real-time trendy filters, auto beautify, face and body tune: enlarge eyes, charming lips, whiten&smooth skin, facelift and remove eye-bag. – Video dubbing. Record and use your own voice or our sound effects. – Doodle on video. Zoom in and out. Let your audiences focus on the region you want! – Powerful video trimmer/video cutter: cut or crop the unnecessary parts of your video. – Fast trimming: trim & crop your video, edit clips, photos, images in no time. – Video to Mp3: turn the soundtrack of your video into mp3 file. – The materials store has: theme/effects/stickers/fonts/sound effects/hot music, and it keeps updating all the time! Ez to use, fun and capable of a lot of effects and heavy editing such as 1080p videos that go for 5 to 6 mins. – Import HD 4k videos for free. Support most video formats, like MP4, MOV, AVI. Share your videos on Facebook, Instagram, YouTube, WhatsApp, Google+, Twitter, Line, Wechat, Quik, Inshot, Funimate, Whatsapp, Vine, Flipagram, Musical.ly, Vue, Apple tv, Lip Sync Videos, Dubsmash Video. Square themes and no crop mode, blurred background, voice enhancement make the video/slideshow more appealing. Save them to the draft/album or share it with no max length limit. VideoShowLite is a smooth and flexible film studio for you to shoot movies, cut movies, crop movies, make funimate finalcut and be a video star. We are working hard on the app every single day to make it better. Thanks for your support to VideoShow video editor!